New images have been released for The Phantom of the Opera London at Her Majesty’s Theatre London which currently stars John Owen Jones as ‘The Phantom’, who has played the role more times than any other actor in the West End production’s history; Celinde Schoemaker as ‘Christine Daaé’, Nadim Naaman as ‘Raoul, Michael Matus as ‘Monsieur Firmin’ and Christopher Dickins as ‘Monsieur André’. 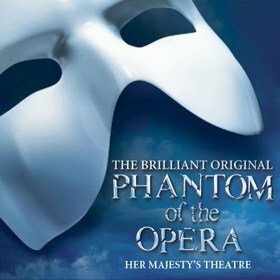 The Phantom of the Opera has won 70 major theatre awards, including seven Tony’s on Broadway and three Olivier Awards in the West End. It became the longest-running show in Broadway history in 2006 and is the second longest-running musical in the West End. It is estimated that The Phantom of the Opera has been seen by more than 140 million people worldwide.